HARLEM — A start-up that lets you order home-cooked meals, a website that connects musicians all over the word and a mentoring network for aspiring photographers are just some of the companies that've joined Harlem's new business incubator. 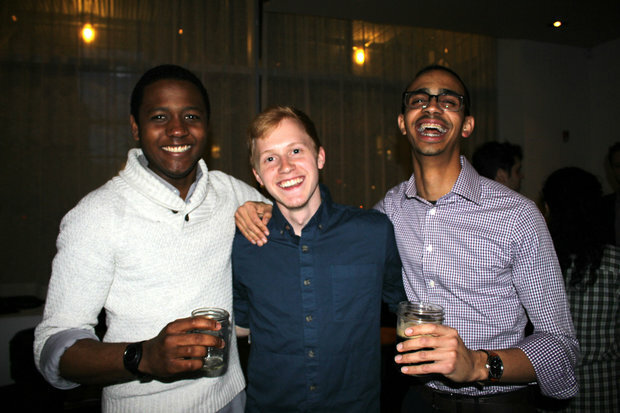 These young companies got free office space and access to mentors from tech companies like Google, Voxy and Genius after agreeing to stay in Harlem for five years, thanks to the incubator CoFound Harlem. Start-ups Localtarian, Bandhub, Reveu.me, and Perqy have joined Cofound Harlem so far and started moving into TEEM co-working space on 1463 Fifth Ave. earlier this month. Two weeks ago the four companies sat with mentors — who include legal experts, programmers, and investor consultants — for the first time. After they each gave a short pitch the mentors chose which start-up they wanted to work with. The companies will be a part of CoFound for 9 months. They get free office space at TEEM and mentors to help them grow their business, the market value of the space and network of mentors is $50,000, Henry said. Once they are done with the program they don’t have to pay any of it back until they turn a profit, he added. This group started by students from City College founded a website that lets people order home-cooked meals from their neighbors. As long as their order is in before 4 p.m. they can get dinner delivered to their home, said co-founder Daniel Gutierrez. The cooks prepare the dishes from their own homes and the company has it delivered to the customers. Each chef must have a food handler’s license, which Localtarian reimburses them for. Once they set up a menu the cooks split the earnings with the company 80-20. The cooks are a mix of local professional chefs, stay at home parents, and people who want to earn a little money on the side. A Dominican woman who lives in Hamilton heights makes a seared salmon filet, marinated in fresh orange and onion sauce and served with grilled vegetables for $14. Localtarian is only available in the 10031 zip code for now, but it plans to expand within Harlem soon, Henry said. Bandhub is a website that connects musicians from all over the world to record music together. A guitarist from Dallas can find a drummer in Madrid, a vocalist in Buenos Aires and write a new song or play a cover. The site already has close to 50,000 users, 20 percent of which spend more than 2 hours on Bandhub per day. They have recorded more than 68,000 songs, Henry said. The co-founder, Pablo Osinaga, grew up in Argentina and has lived in New York since 2007, he said. Whether you're a photographer or musician, Reveu.me offers aspiring artists a chance to connect with a mentor. The company was founded by a group who run a digital magazine for emerging artists called Paper Cut. They used to have an ask-the-expert feature and it was so popular they realized there was a demand for mentorships. The company wasn't really based anywhere before joining CoFound. They met at various cafes and coordinated online. Although none of them were based in Harlem, they didn't mind the move, said co-founder Jamall Oluokun. Perqy connects businesses to companies looking to boost employee morale with discounted perks. Companies get access to discounts like 50 percent off Yankees tickets, bottomless Sunday brunch and half-off cycling classes. Employees can browse the "marketplace" and vote for their favorite perks.